It seems like the V12 engine is running out of life as automakers begin phasing them out of their lineups. Mercedes recently announced a limited edition sendoff for the S65 AMG, Audi has admitted its W12 won't be around much longer, and Jaguar hasn't built a V12 for many years. BMW still offers a V12 on the M760Li xDrive, though this massive engine is rumored to be on the chopping block due to difficulties passing emissions tests. The next-generation 7 Series has even been rumored to drop the eight- and twelve-cylinder engines all together to focus one inline-sixes and electric drivetrains. In an interview with Top Gear, however, BMW says the V12 will be safe at least for a few more years. Michael Bayer, head of powertrain for the 7 Series, said: "We will keep [the V12] for the rest of this generation at least, until 2023." So after this current generation 7 Series is replaced, the V12 will likely die with it, right? Well, Bayer explained that the twin-turbo V12 could be designed to comply with emissions and efficiency regulations but admitted such a task would be difficult. At this point, we have to ask why BMW even feels the need to offer a V12 engine when the V8 is already so powerful. It turns out BMW customers still want a V12 engine. "Since we revealed this car, we have been at maximum capacity building these engines,” said BMW 7 Series product chief Christian Metzger. 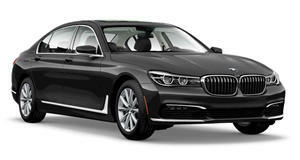 In the US, the M760Li xDrive produces 600 horsepower and 627 lb-ft of torque from its 6.6-liter twin-turbo V12. Due to European emission regulations, BMW has been forced to lower the engine's output to 577 hp on Europeans models. The 4.4-liter twin-turbo V8 in the Alpina B7 produces more than that with 600 hp and 590 lb-ft of torque, making us wonder why anyone even bothers with the V12 anymore.